Emergency aid from We Effect, consisting of food, repairs and seeds have now reached families affected by typhoon “Storm 10” in Vietnam. But the danger is far from over. The farmers are witnessing a changing climate. 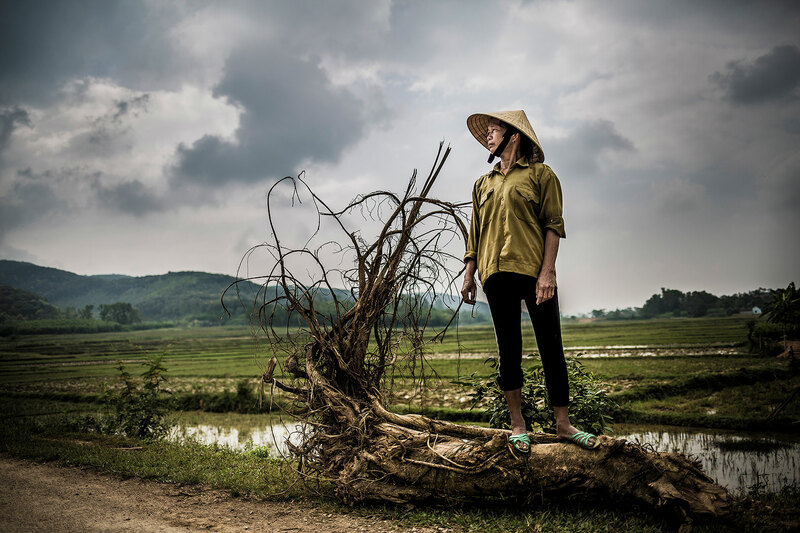 – I have never witnessed anything like it, says Ho Thi Phuong, who lost most of her trees and a large portion of her crops. NGHE AN. 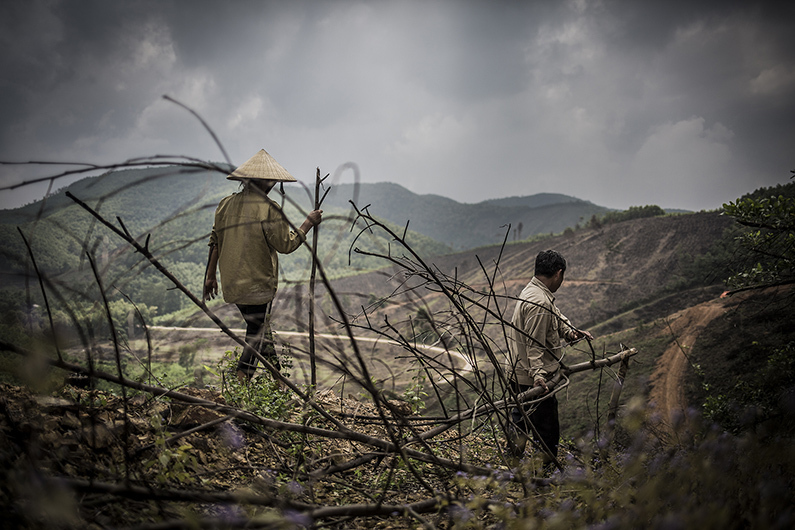 Next to what used to be Ho Thi Phuong’s cornfield sits a man-size trunk of a tree. It used to be at the neighbor’s farm – now it clearly portrays the violent impact of the typhoon. The name of the typhoon, Storm 10, bears witness to the fact that this was only the last in a long number of extreme weather events to hit Vietnam this year. Storms have been worse than in over a decade, report says; almost one hundred and fifty people have lost their lives only in the last month and more than 100 000 hectares of crops have been destroyed. Nearly 100 000 houses have been damaged or destroyed. – The wind and the rain was strong for ten days; the water reached our house. Our corn was almost ready to harvest … but now it’s all destroyed. And all of our trees blew down in the storm, says Ho Thi Phuong. In her arms, she carries a four-kilo bag of corn seeds. It’s a lifeline, that will let her and her husband to replant corn on their field. They have also received a bag of fertilizer from We Effect. – If nothing unexpected happens, we will have a new harvest of corn in a few months. But the wait will be long. For smallholder farmers, that already are having problems of making ends meet, a spoiled harvest can be life threatening. The harvest means everything: income, food, stability, survival. For some, all that remains is sorrow. In this commune, a 16-month-old baby drowned in the water masses. This year’s extreme storms also creates uncertainty in a longer perspective. – The worst thing is that I don’t know when to sow next year. We always plant our corn in September and harvest it in November. But, now, everything has become so unpredictable, says Ho Thi Phuong. This is a feeling she shares with many of the farmers I meet in the area. They have never heard of the expression “climate change”, but all are reporting increasing difficulties of planning their farming. Nguyen Thi Hoa and her daughter Dao Thi Hanh show us around on their family field. They lost almost all their corn crops to the typhoon. – I can’t remember a storm that’s been worse than this one. Steel roofs were blowing off buildings. Storm 10 hit the area at night. In the morning, looking outside, Nguyen Thi Hoa saw fallen electrical poles and trees that had snapped like matches. And their corn crops, their livelihood, was severely damaged. – It was a sad sight, seeing our corn destroyed like that. I have replanted some of the crops but the harvest won’t even be half of what it should be. Dao Thi Phuong. Photo: Marcus Lundstedt. Nearby lives Dao Thi Phuong. She has been affected even harder than most in the area. Her rice harvest was severely damaged by a storm in June. A few months later the typhoon destroyed most of her corn. The emergency help gives her some hope for the the nearest future. – I am thankful for receiving seeds from We Effect. It will enable me to bounce back a little faster, says Nguyen Thi Hoa. The emergency response in the provinces Yen Bai, Nghe An and Son La reaches about 1 000 members of cooperatives supported by We Effect. The farmers receive new seeds and help in restoring their fields and houses. Some cooperatives also receive water tanks and pumps. Those affected the hardest also receive food.